MSV: Hoboken Campaign $$$ Splash: Bhalla campaign exceeds half-a-million! Hoboken Campaign $$$ Splash: Bhalla campaign exceeds half-a-million! 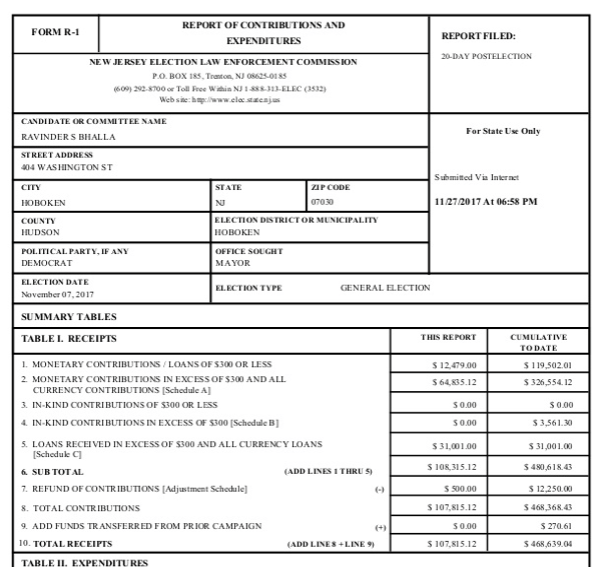 The post campaign election reports through NJ ELEC are beginning to become available and the numbers are going to bowl Hoboken over. The first campaign to become available is the Bhalla Campaign and their campaign receipts are going to be tough to beat. 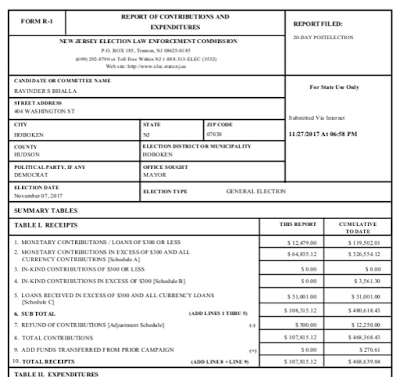 The campaign splash of funds according to a breaking report on the Hoboken Resistance and Advocate show the Bhalla campaign report netting over $468,000. In addition, the pro Bhalla PAC, Stronger Foundations spent over $70,000. The NJ PAC ran cable TV ads over the last week of the campaign urging Hoboken to vote for Councilman Ravi Bhalla. The total expenditures in support of the Bhalla campaign efforts is over $538,000! In addition, the issues oriented website Hoboken Resistance & Advocate identifies a surprising payment to a blogger who is a paid political operative for the Bhalla campaign. The information was never disclosed during the campaign and further explains all the misinformation, personal attacks and yes, defamation noted during this campaign cycle. Talking Ed Note: By way of comparison, Councilman Mike DeFusco is anticipated to show a campaign report in the ballpark of $400,000. City Council President Jen Giattino did a remarkable job in a grass roots four month standing start effort of approximately $155,000 the vast majority coming from Hoboken residents. Freeholder Anthony "Stick" Romano was largely self-funded and his amount should be in a similar vicinity.